Local artists and a small group of Selkirk High School students have worked together to brighten up a prominent empty property in the town centre. 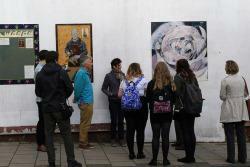 Assisted by a small grant from the Selkirk Conservation Area Regeneration Scheme (CARS), the artists and pupils have produced five pieces of artwork. These were unveiled on the former Co-operative building in Scotts Place on Wednesday 28 September. Our Community Learning and Development team set the challenge to see how they could help make Selkirk a more resilient community and make local improvements. After looking around the town they decided they would like to brighten up part of the town, with the so-called “Poets’ Corner” their chosen spot for some artwork to encourage happiness and well-being. The empty building had been secured with some new boards, but these were plain, and the Selkirk WASPS artists had already set their sights on brightening them up. Selkirk CARS project manager Colin Gilmour got the two groups together and with the consent of the property owner they worked together over the summer to produce the artworks. “The hard work of these young people and local artists has certainly achieved their aim of brightening up this prominent part of Selkirk. “There is a degree of uncertainty regarding the future of this building, however the artwork panels are removable, so whatever happens these can be displayed elsewhere when future development of this property does occur. Following the success of this project, the students are now planning to apply to Youth Chex for funding to create another piece of art work for the town. Selkirk WASPS are holding their annual open studios event at St Mary’s Mill, Selkirk on Saturday 1 and Sunday 2 October. More images are available on our Flickr page.